Manufactured with an exclusive brass center, E.C. Moore produces 10 varieties of abrasive textures, each available in 4 diameters. 1/2";5/8";3/4"; and the most popular 7/8". Discs are packed in boxes of 50 in cartons of 12 boxes. They are priced in boxes of 50 and the price varies by abrasive surface. 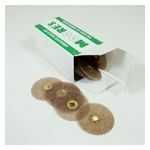 With their flexible paper back Moore discs are very useful for working around prongs. The Garnet abrasive is the hardest grain and therefore provides the heaviest cutting action.